Rome Opera House to give performances in the State Kremlin Palace 21, 22, 24 and 25 September, 2002. 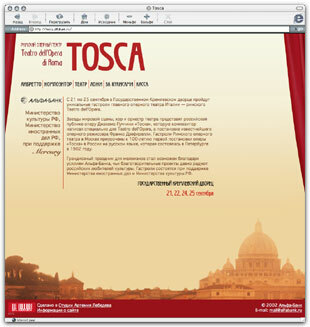 Teatro dellOpera di Roma presents Giacomo Puccinis Tosca directed by the famous Franco Zeffirelli. The performace celebrates the 100th anniversary of the first Russian staging of this opera in St. Petersburg in 1902. The site provides tour information, opera libretto, biographies, history, interviews, and so on. Ordered by Alfa Bank, one of the tour organizers.